The goal of this yacht is to deliver the ultimate and most reliable technology, combined together with a comfort blended to the luxury that is expected from the best European yachts. Our aim is to deliver a yacht which is 100% reliable in all functions, providing maximum safety and comfort. The Nedship D stands for Displacement, as we believe that more and more of our prospective clients want yachts with low fuel consumption. The yacht is designed to reach a very smooth and comfortable stay on board, both on cruising and on anchor. 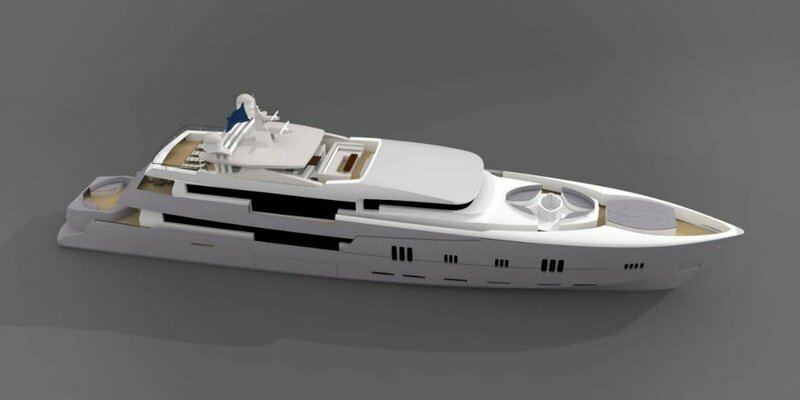 By using lightweight materials and a very efficient hull design, the yacht is becoming a very economical yacht with an interesting range of about. 2,100 nautical miles min at 11 knots. These numbers can be increased by adding extra tank volume and optimizing the last build specification indicated from the tank test. An additional advantage of this weight concept is that the yacht has a low draft, so that she is able to dock or anchor in a wider variety of beautiful bays and marinas. 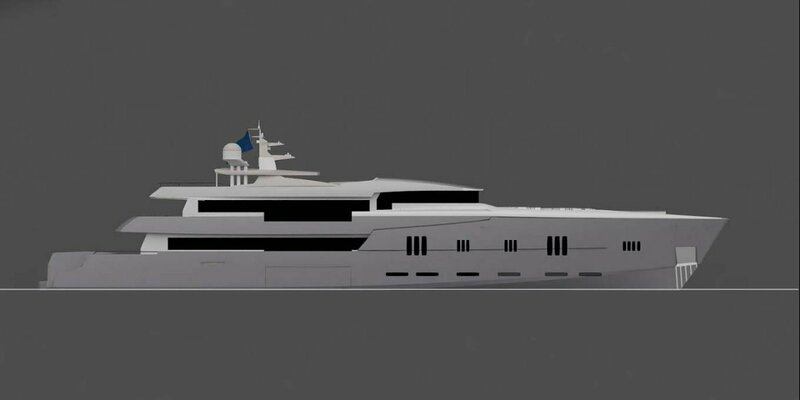 The yacht will be built with advanced composite materials. 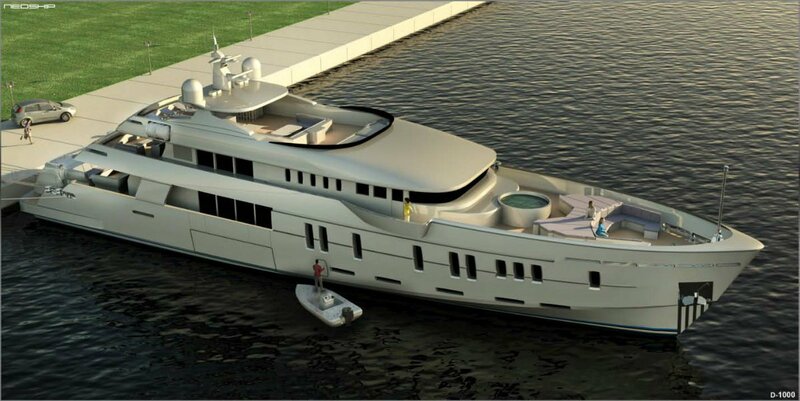 The materials are well chosen and the shipyard uses unique patented construction methods as special piping fixings or special sound protecting systems are brought into this project. The material is strong as steel but lighter, the perfect modern state of the art way of building Yachts. In comparison with conventional vessels, built in fibreglass, we have here no problem with osmosis or other negative effects coming from the sea. 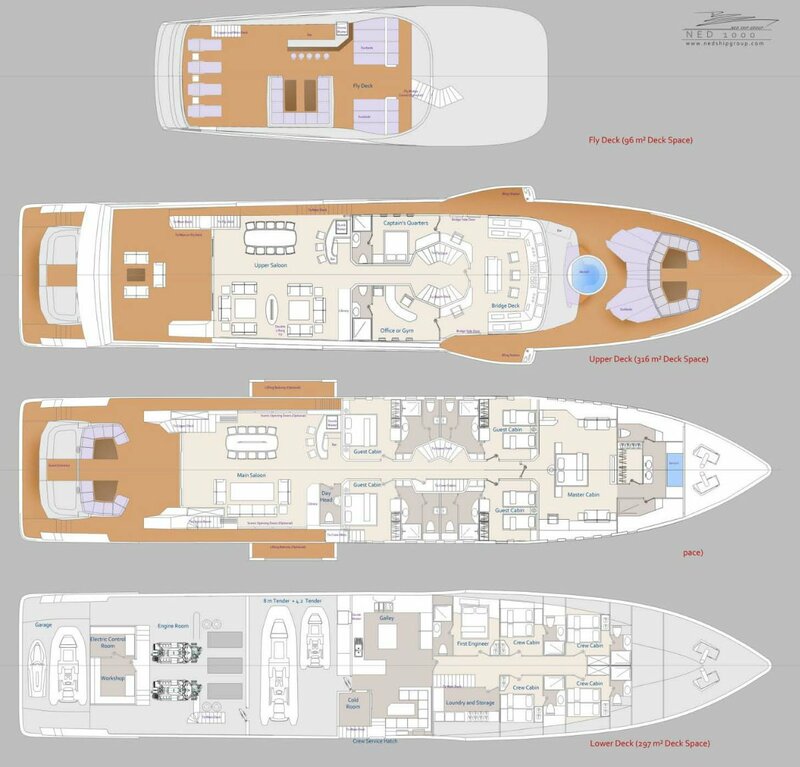 The layout was designed together with owners, crew and captains consultancies and a team of charter brokers who were able put in their experience in yacht building as well as taking into consideration the wishes of all involved parties. All these layout suggestions could be perfect for an owner who wants the ultimate privacy for himself and his family, but who also has the opportunity to have an excellent charter layout which is the basis for any successful charter market. All technical systems mentioned or to be specified in the list will be to the highest ship building standards. 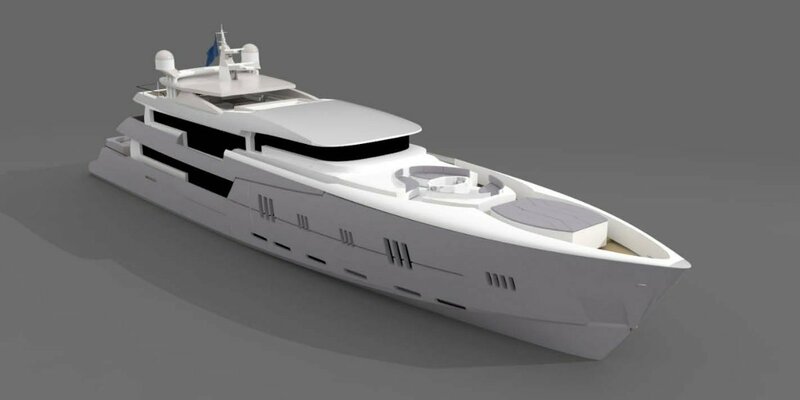 They will be solidified throughout the construction of the yacht in accordance with the owner as well as limitations brought forth from the classification society, the engineers and the designers of the project. To achieve a quality yacht of proper marine practice and in accordance with the owner’s expectations, at the specified budget, will be the essential agreement for the yacht. The design is born in the TSMM studios of NEDSHIP GROUP, Antalya. This studio was also responsible for a lot of other attractive Yachts such as MY Phoenix, MY Momentum, MY Dreamer and the MY TaTii. The whole outside areas is a dedicated space especially for the Owner and Guests! The toys and dinghies/ribs are well stored in two different garage systems. The smaller toys can be stowed in the back garage which is also used as a Beach Club, and the bigger Dinghies or tenders are to be stowed in a huge side opening garage. By having the side opening garage before the engine room, the crew cabins becomes quiet, as the engine room moved into the stern part of the yacht. This garage therefore offers storage for 2 tenders up to 9m in length. Another important advantage is that the crew has access to all areas and machinery below, and is able to service the vessel to an optimum, without disturbing the Owner and Guests. The lines of the yacht are sportive but timeless. 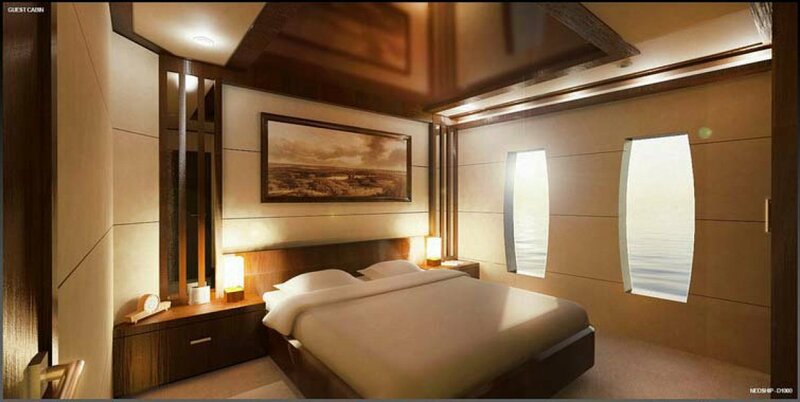 Another main focus was that the Yacht offers a lot of daylight inside the cabins. As an option, the side garage openings can be converted to 2 big balconies for the main deck salon, where in addition the side windows of the salon can be fully opened. The yacht has 5 different areas. The Owner and guests–besides their own cabins- will find a place for privacy or meeting friends: Located on the bow is a seating and/or sun bathing area including a Jacuzzi. This is a fantastic place which can also be used whilst staying in the harbour. The Jacuzzi can be converted into a round sun bed platform. A heli pad as an option will complete the high specs of the D-1200. 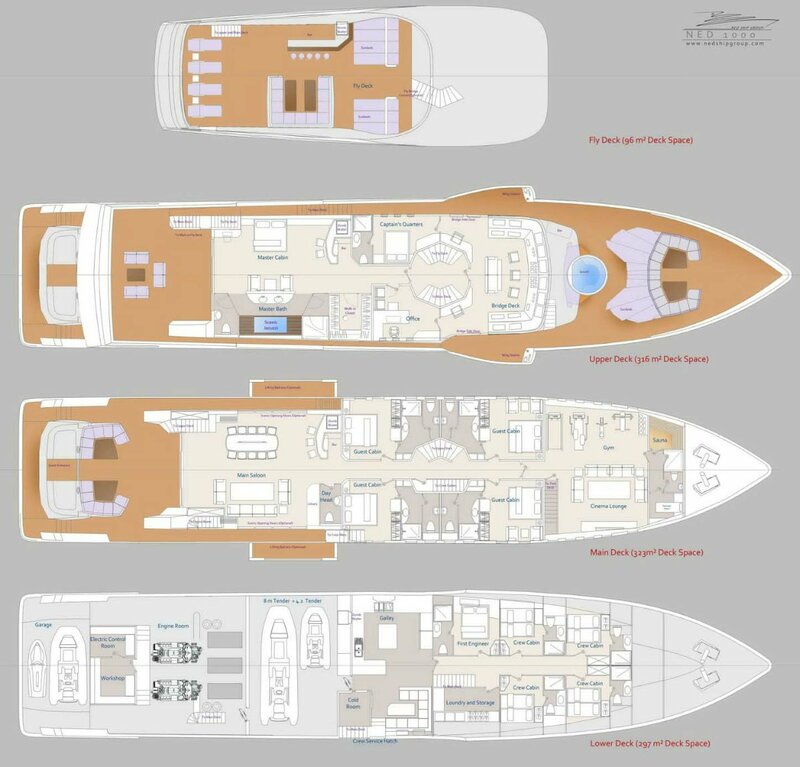 On the huge top deck is another sun-bathing area with a bar and event corners and/or a Jacuzzi (Jacuzzi option is instead of a Jacuzzi on the foredeck). This deck can also be the party and dancing floor deck. On the upper deck there is another “Lounge area”, with an elegant salon, bar and dining table and some bar tables in the cockpit area. From our charter experience, this is the place to be. On the main deck we have created a huge main salon where it is possible to open not only the entrance door but also the sliding side windows, where we then find ourselves in another open area. Imagine that you are in a bay with beautiful waters and enjoying your stay in the shade, with lots of fresh air. Finally, guests can find on the sea level an optional Beach Club, so water activities can be carried out on anchor. Every area will be well protected from the sun. The Option 2 layout is the most optimum for the owner, but also provides all guests with maximum comfort as all cabins are on the main deck. This something relatively new to the market. Furthermore, option 2 layout has a fantastic leisure centre at the forward main deck. This area is accessible for all Guests and also directly for the owner. Another fantastic feature is an exit from the leisure centre area to the foredeck where it is possible to either use the outdoor seating area or take a bath in the Jacuzzi. All Guests stay on the main deck in 4 comfortable cabins with en-suite bathrooms. By placing all the guest cabins on the main deck, they are much more spacious and noise insulated than on the lower decks. The cabins have a lot of day light and even in the shower there is a big window for a more spacious feeling. Also on the main deck in the forward section, the owner can find his own studio (Option 1). His suite is the full beam size of the yacht and the en-suite bathroom and dressing room accommodates everything for a well prepared start to the day. The main salon is divided into several sections. As the main and upper deck salons have nearly the same sizes, the dining and sitting areas can be organized according to the needs of the guests. In the main deck salon there is the possibility of having a library, a relaxing area, a sitting group for discussions and conferences. In the upper deck salon a bar area, cinema and fun club sitting can be integrated the Lounge. In the case that a big gala table should be needed, the loose furniture in the main or upper deck salon can be changed into a large table for more than 20 guests. To keep a yacht variable for different events and needs is one of the most important things an owner can have. Flexibility without creating stress is an utmost important task for the owner and the crew. The galley, which is located on the lower deck between the garage and the crew cabins, is based upon a high professional standard and includes a large walk in fridge designed for comfort whilst making long trip. Following from the galley the crew mess is attached, so that the crew is well accommodated on their own deck. From the galley, the crew can enter their cabins from the same floor, which has nearly guest standard sizes on comparable yachts. Ten crew members in 5 double cabins can stay in that area, each with comfortable bathrooms. 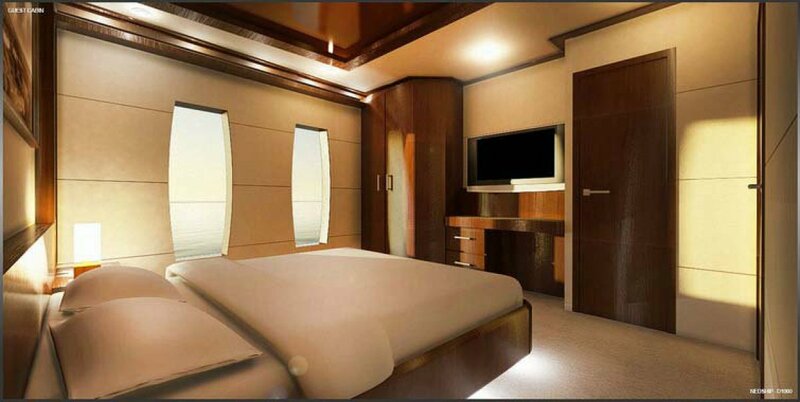 In addition, the captain stays beside the pilot house in a comfortable double bed cabin with an enclosed bathroom. A private office, either for the owner or the guests, is located on the upper deck near the pilot house with all necessary technical and communication units, including its own small bathroom. As a side mark, a bar is integrated in the upper deck salon to serve guests and owner. The service from the galley is supported by a big dumbwaiter through all the decks. The main entertainment and cinema corner can also be located in the upper deck salon opposite the dining table. A beach area (as an option) can be created on anchor on the sea level behind the stern garage, so that water activities can be done very easily. This garage can also accommodate a Gym studio if needed. The interior design and décor was studied for natural and high tech illumination, temperature control, and acoustical balance, seating and sleeping ergonomics all with an elegant minimalist style paradoxically rich with texture and colour which is appealing to the most discerning eye. As an Option, the advanced and solid lighting, video and audio equipment will entertain even the most serious electronics enthusiasts. Live streaming television and radio over internet reception, plus video and music on demand from the huge database of pre-recorded media storage library, offer a versatile entertainment package for everyone. 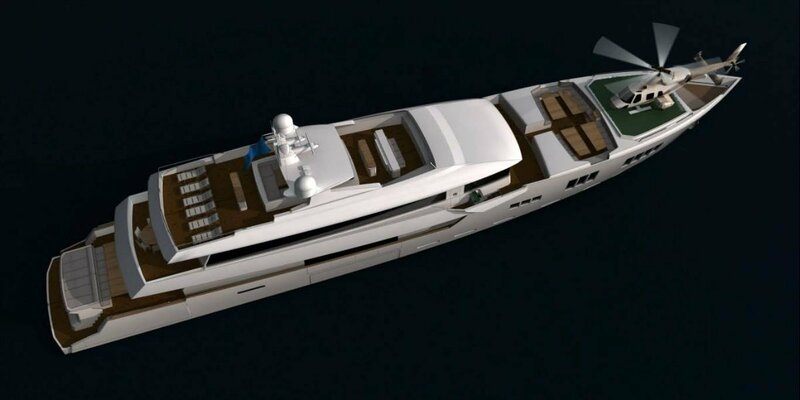 The NED D-1200 Yacht has been designed as a long range motor yacht for extended cruising, with an advanced displacement hull. The hull and superstructure are built under RINA Charter Regulation. In this uncompromised charter criteria, the NED 1200 can carry up to 12 passengers and 12 crews. The yacht is built in advanced high class epoxy composite. The QUANTUM Zero Speed stabilization has been carefully matched to the unique hull form to create an incredibly stable yacht. The engine room has an integrated control room for the engineer and all the units in the engine room are well organized and safely installed. All piping is done by the patented system by NEDSHIP which avoids noise and vibration. A special method to stop the engine noise is used in a very efficient way. Ensign Ship Brokers was established in 1980 and over the last thirty years has grown into the largest brokerage in Australia, with hundreds of listings on their database and networks extending worldwide.